I have been wanting to enter the Summer Fun Photo Contest at 5 Minutes for Mom, but just didn't have a picture that said Summer Fun to me. Well, until this weekend. We went to the County Fair and I took this photo of my niece. I decided I have to enter now. So here it is. All the kids were screaming, especially my niece. She was cracking us up. 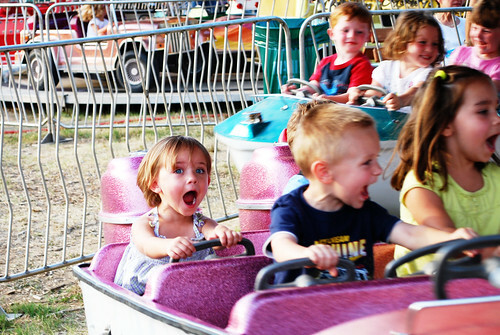 She screamed with joy for the entire ride. I mean look at that face. Now that is some good Summer Fun!! How cute is this! I love it. I love her expression! What a cutie. You caught this so perfectly. I love how she is hanging on tightly and looking right at you! Dont you love squeals of excitment from kids. You cant help but smile. Oh goodness, that is too great! I can totally hear her screams of fearful delight. Perfect for the contest! What a cutie, ha! I hope you win because for one its a great shoot and two it sure would make her mommy proud! This is an adorable picture and I'm glad to see it made it in the finals. I voted for it over on 5 Minutes For Mom.